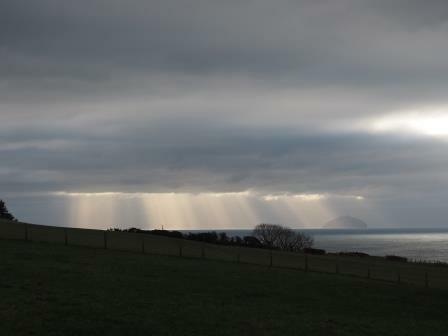 Sunshine & showers over Ailsa Craig in the Firth of Clyde, also known as Paddy’s Mile stone as it marks the halfway-point between Belfast and Glasgow. The name may mean ‘Faerie Rock’ in old language (? Gaelic). Over the year it marks the Winter Solstice, the furthermost point the winter sun sets, gradually heading north until July sunsets are over Goatfell. A steadfast little rock, sanctuary to seabirds and still mined for granite for curling stones…. Thanks for keeping company today, I’ll be away from my blog for sometime, with a scheduled post tomorrow.